Here’s a soup I adore having on the Friday after Thanksgiving. There’s just something so nice about a simple soup supper after all that gluttony the day before. But, if you’re too busy to cook on Friday, or want to save this recipe for a cold January night instead, you have a couple of options: make the stock now and freeze it, or freeze the bones and the extra meat separately and do the whole thing later. The freezer is your friend! 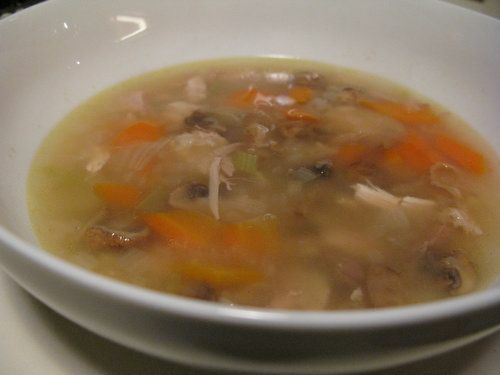 Turkey Carcass Soup, after the jump. Strain the stock and skim off the fat. Remove all bones, reserving the turkey meat. Discard the bouquet garni and bay leaf. In a large saucepan, saute the onion and garlic in butter until soft. Add the carrots, celery and mushrooms, and cook the vegetables, stirring, 3 to 5 minutes longer. Add the flour and cook the mixture, stirring, for another minute. Add the stock, marjoram, herb mix and barley. 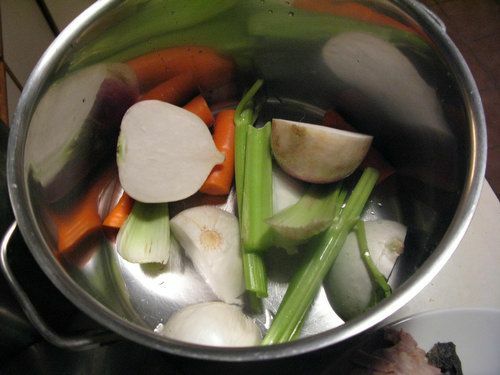 Bring the soup to a boil, reduce the heat and simmer, partially covered, for an hour. Add the turkey meat and the hot pepper sauce, adjust the seasonings and heat the soup to boiling. Sprinkle the soup with parsley just before serving. Saw this in the paper, and decided to follow it to make my soupt. So I made the stock, 3.5 hours of simmering. Smells great. Making the soup and I get to the part where it says to add the Marjoram and herb mix, but there is no herb mix in the ingredient listing. Check online to see if a correction is posted, but no. I guess the proofreader had the holiday off. I’ll think twice about using one of your recipes next time.